Our table top is made of 1.5" solid beech wood, and finished with a semi-gloss. Beech wood is a medium-to-hard wood with a tight grain and large medullary rays, similar to maple or birch. Create a custom look by selecting from a variety of stain options. Please note: There may be slight differences in the stain due to variances in the wood grain. 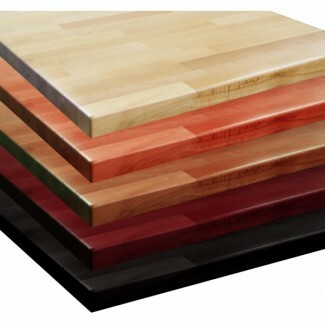 Our Indoor Wood Table Top Collection has a lead time of 3 - 5 weeks from the time your order is processed.